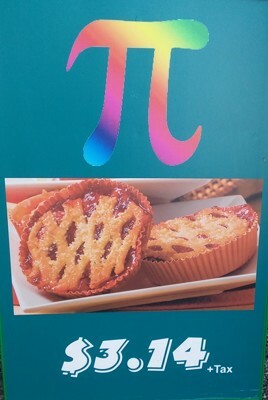 Would you like some Pi? I spotted this at work today while making a delivery at one of the restaurants. This was in back area on the park and was from "Physics day" a few weeks prior. Physics day is an event the park sponsors that bus in school kids that have excelled in physics and the sciences. I wanted to save this one for Manic Monday but couldn't wait. Alex, your photo of tasteful 'pies' makes me run the water into my mouth. I also have a problem because it also causes a smile on my face () , due to the well chosen symbol Pi (π) for the physics event, while Pi (π) represents approximately the value 3.14 and is also the price that has to be paid for these delicacies. A very well chosen combination! Pi in yer eye - what a bright clever and appealing sign !! Great idea and perfect sign they made Alex. Good you captured it to share with us. It could only be better if it were a la mode! Alex, this is pretty neat. The "plus tax" was a hit with me too!